Some nurseries in England and Wales are serving processed foods, sugary drinks and foods high in additives, salt and fat, a survey has indicated. It found foods such as crisps, chips and biscuits - banned or restricted in schools - appeared on nursery menus. The Soil Association campaign group and organic food company Organix surveyed 487 nursery workers and 1,773 parents. The Westminster government questioned the reliability of their findings and said meals must, by law, be healthy. 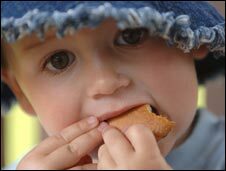 The survey suggested the average amount spent on food in the nurseries was £1 a day per child. But 3% of them were found to be spending as little as 25p a day. One fifth of the nurseries in question did not inform parents what food was being served during the day. Oil-rich fish such as salmon, trout, mackerel or sardines were only served in 8% of them. Of the parents surveyed, 21% described the food at their nursery as poor or mediocre. The Soil Association and Organix are calling on the government for tighter regulation of pre-school food provision. But England's Department for Children, Schools and Families said the education watchdog for England, Ofsted, had rated the majority of early years providers as good or outstanding in relation to providing a healthy diet. "We would question whether a self-selecting online survey provides more reliable findings than Ofsted about the quality of food and drink," a spokesman said. "We agree it is important that all childcare settings support parents in helping young children develop healthy habits. "That is why it is a legal requirement in all childcare settings, including childminders, nurseries and day care, that where children are provided with meals, snacks or drinks, these must be healthy, balanced and nutritious. "It is also a legal requirement that fresh drinking water must be available at all times, that children should be encouraged to try healthy food, that messages about healthier food choices are reinforced and that children are involved in the preparation of food." Soil Association policy director Peter Melchett said the quality of food given to children in nurseries had been overlooked. "Children under five are at their most vulnerable. It is then they really need healthy food. "This report sets out what nurseries, parents, and the government must do to make sure every child gets the healthy food they need for a healthy start in life." The founder of organic food company Organix, Lizzie Vann, said: "The state of food in too many nurseries is indefensible. "The government must take responsibility for food in nurseries as they have in primary and secondary schools, and substantial changes must be made urgently. Our children deserve nothing less." How do you get pupils to eat well?